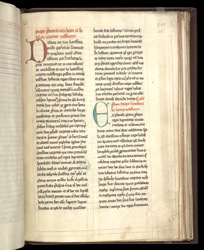 The fullest surviving account of the life of St Milburga, this manuscript may have belonged to the Cistercian abbey of Croxden (Staffordshire), which is a fairly short distance northeast of the Cluniac priory at Wenlock, where she had founded a monastery in the late 6th or early 7th century and which was refounded in the 11th-century. The last page of the manuscript has an inscription which reads, "This book is from the valle Sancte Marie." The inscription suggests that Croxden was its home, but Bethgelert, County Carnarvon, has also been suggested. This page contains the preface to the account of life of St. Milburga, and the start of her genealogy. She was of the royal family of Mercia, one of the most powerful of the Anglo-Saxon kingdoms. Two of her sisters also founded monasteries. They were not unusual in Anglo-Saxon England, however. Royal women were indispensable in Christian conversion, notably the teaching and training of churchmen in their monasteries.